i don't know why i'm standing with both hands on my hips. i don't know if the drape-y cardi look is still hot this season, but it better be because they are a key item in my fall(ish) wardrobe. the truth is, i'm a simple girl that likes cute, casual but comfy clothes that i can mix and match and spruce up with different accessories. jeans are my friend. i wear the same things a lot. a lot, a lot. like i get stuck in a rut. so, i'm challenging myself to shake things up a bit next week by embracing the cowboy boots with a dress, mix brown and black and wear a belted cardigan. i hope i make it. 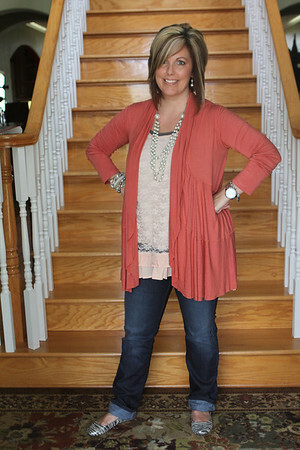 i'm linking up again with the pleated poppy and momma go round for fashion fun and accountability. great outfits, I love the sweater too, a nice layer to make an outfit!! I was telling myself this morning that i need new shoes - it looks like i need to make a trip to target! I LOVE that striped sweater!! I'm seriously loving stripes this year - and paired with the mustard necklace it is beautiful! So chic - well done! I need to look for that cardi!! I want to see how you wear brown and black together. I have brown boots and I bought a black cape/wrap thingy and I think I should wear it all together but so far have not. Love both outfits!! 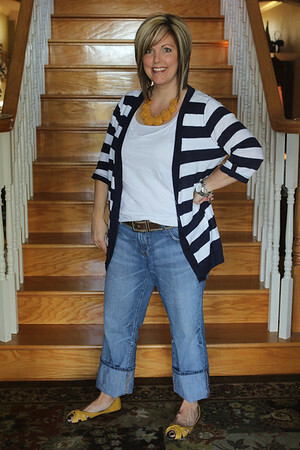 Especially love the striped cardigan!! !